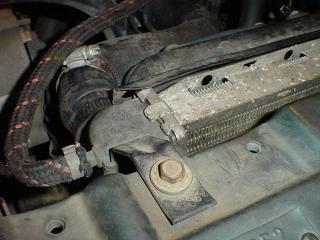 VW radiators seem to last about 140,000 miles. On my 1989 Golf one of the end caps started to leak. 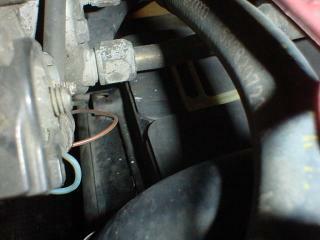 The Cabriolet had a new radiator, but the hose flange was snapped off half way along it's length. That's a weird break. 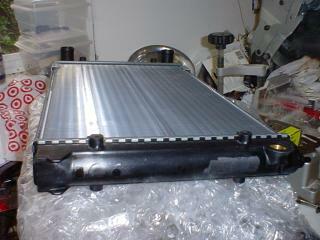 Here we see the new radiator which I got from Virtual World parts ( parts4wvs.com ). 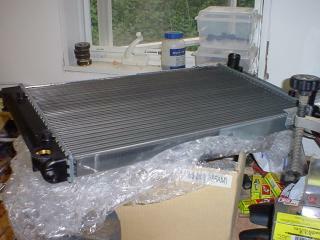 The radiator is aluminium, with plastic resin end caps. The temperature sensor flange is bronze, and is cast into the end cap. 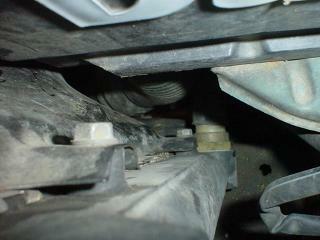 In the lower, left of the photo is the upper radiator hose. This had popped off because the flange on the radiator was cracked. When refering to the car, front is front, and right is driver side. 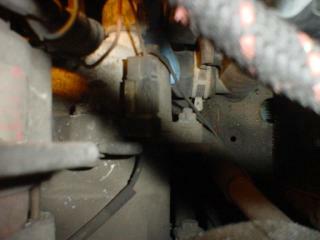 Upper, left of center in the photo is the lower hose (which is on the left side of the radiator, same as the upper hose). Even though it has a screw type hose clamp the (idiot) mechanic who worked on it last left the factory spring hose clamp on the hose. That is a bad idea, and lazy to boot. 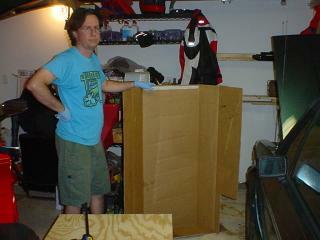 I always wear gloves, and I put cardboard on the garage floor. 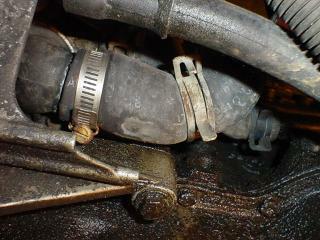 A close up of the lower hose. 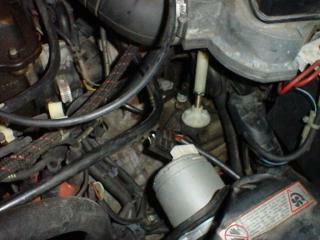 Notice how the spring clamp is squeezing the hose. This kind of things gives mechanics a bad reputation. 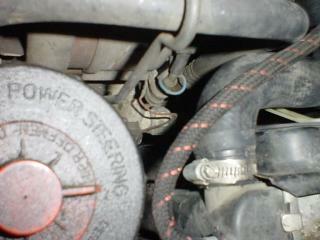 The good quality screw clamp is on the left of the photo, actually clamping the hose to the radiator. Radiator upper left bracket. Remove this. Right radiator bracket. Remove this. At the bottom, left of the radiator is a temp sensor. Pull off the electrical connector. It has locks that you have to press to release. The sensor is the brown thing in the center of the photo. Remember, in most of these photos I'm standing in front of the car, facing towards the rear. The starter motor is kind of close to all this. 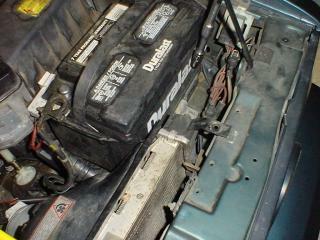 Disconnect the battery negative terminal before removing the radiator. It turns out that it helps to remove the battery. 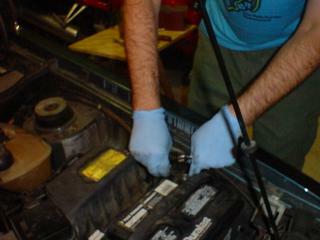 Here I am disconnecting the negative terminal on the battery. Just lay the cable aside. 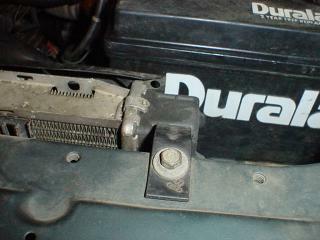 The cooling fan is attached to the radiator. Leave it attached and pull the whole thing out as a unit. After I started I decided that the battery had to come out. 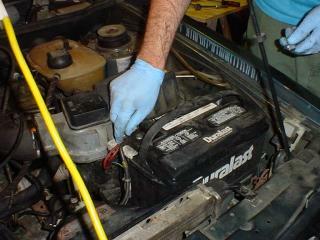 Remove the positive terminal, and the battery retainer at the front, bottom of the battery.